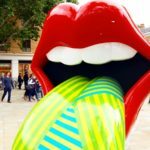 Part of the husband’s birthday present from me was tickets to go and see the Rolling Stones exhibition at the Saatchi Gallery in London. I say “tickets”, it was actually one ticket, because the other one was for me! Buying tickets as a gift generally means that I get to benefit too (unless it’s something hideous that I have no interest in, and then he can have the pair and take a third person of his choosing). It would be unfair of me to class myself as a fan of the Stones. In fact I always maintained that I didn’t really “get” them. I didn’t grow up with their music and a lot of it seems fairly uncomplicated compared to stuff that I listen to. But when they announced a gig in Hyde Park 3 years ago, and a lot of my friends wanted to go, I was definitely up for it. Partially because of good old FOMO (which I’ve posted about before), partially because it could have been a piece of history (I mean, they are getting on a bit), partially because I was curious, and mainly because I fancied a day out with my friends. In truth, it’s right up there with one of the best days I’ve ever had, EVER. 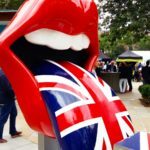 It was so much fun, the weather was great, the setup was great, everyone was happy and smiling and The Stones were amazing. I really understood the hype that day. The atmosphere was electric, they sang all the hits and seeing them live definitely made me look at them in a different way. Anyway, back to the exhibition. The entire Saatchi Gallery is devoted to it from April until October this year, which in itself is no small achievement as the Gallery spans multiple floors and usually houses multiple exhibitions at once. Entry is timed so you have to book your ticket for a specific day and time slot, which are spaced 30 minutes apart. Once inside it becomes apparent why this is done, because you’re taken on a journey through various gallery spaces with various media delivery, so it’s obviously a way of keeping numbers controlled and ensuring everyone gets a fair crack at seeing everything. Going on a Saturday at 11.30am I expected it to be really busy, but we arrived pretty much on the dot (thanks to a delayed Virgin train) and walked straight in. It’s incredibly well done, starting right from the early beginnings of the band, through the 60s and right up to present day. There’s such a varied amount of information – memorabilia, original instruments, hand written song lyrics, artwork from across the decades; film, music and costumes. Oh, and of course the obligatory giftshop, where you can buy an umbrella for a snip at just under £300 – perfect for these rainy days we’re having at the mo. Unfortunately no photographs are allowed inside, but I did snap these sculptures out in Sloane Square. The exhibition takes around 90 minutes to get around (I mean it could take longer, if you pored over every artefact, but that’s how long it took us and we felt happy that we’d seen everything). Have you been? Would you like to? Are you a fan of the Rolling Stones? Sounds like time well spent! But too bad you weren’t allowed to take pics inside. I kind of understand it in terms of keeping up the mystique, but at £25 a ticket it would be nice to have some photographic memories too!